The Medical Centre was formally established in 1948 and throughout its history has had a solid reputation for dedicated service to the region. From a modest beginning of three physicians, the Medical Centre is now home to over thirty-five medical practices, 19 Family Medicine Specialists, working in a Family Health Team with 5 Nurse Practitioners, and several Allied Health Professionals, serving over 25,000 rostered family practice patients in the Peterborough area. 16 other Specialists provide services on a referral basis to patients from across the region. The Medical Centre, has grown considerably in scope over the years and it offers a broad spectrum of clinical specialties including: Allergy and Immunology, Cardiology, Family Medicine, Internal Medicine and Gastroenterology, General Surgery, Obstetrics and Gynaecology, Oto-Rhino-Laryngology, Pediatrics, Plastic Surgery and Urology. Maintain an Association of independent medical practices supported by an efficient shared business structure which nurtures high quality clinical care and supportive interpersonal relationships. The founders of The Medical Centre were Dr. R.S. Chenoweth, Dr. R.J. Nott and Dr. H.A. Mitchell. During the mid to late 1930’s all three physicians established solo practices in Peterborough. By 1942 Dr. Chenoweth and Dr. Mitchell agreed to share office space and were joined by Dr. Nott in 1943. Between 1945 and 1948 Drs. Morgan, Aitken, Epping, Whyte, Howes and Kelly joined the original group in a practice located at Reid and Charlotte streets. 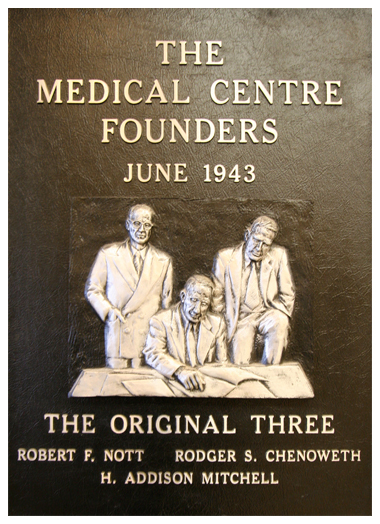 The Medical Centre was formally established in 1948, through the initiative of the original three local physicians. Dr. Rodger Secord Chenoweth was born in Red Deer, Alberta in 1906 and grew up in Escabana, Michigan where he attended school. He graduated from Albion College, Michigan with a BA in 1930, and then from the University of Toronto in medicine in 1935. He interned at the Toronto General Hospital, the Hospital for Sick Children and the Toronto Western Hospital until 1939. He arrived in Peterborough, Ontario in 1939 and with his training, was able to deal with all facets of surgery, practicing and living in one building on Charlotte Street, which he rented for $50 per month. Dr. Robert Frederick Nott was born in 1906 in Stratford, Ontario and went to High School at Oakwood Collegiate. He graduated from the University of Toronto in medicine in 1932 and interned at St. Michael’s and in St. John, NB. He arrived in Peterborough in 1934, practicing and living in an office at 176 McDonnell, until his association with Dr. Chenoweth in 1942. Dr. Nott retired from active practice in 1972. Dr. Hugh Addison Mitchell was born in Grand Valley, Ontario in 1898 and received his high school education in Swan River, Manitoba. He graduated from the University of Manitoba in 1927 and interned at the Winnipeg General Hospital. He worked as a general practitioner in Wilcox, Birsay and Elrose, Saskatchewan until 1936, then did further training at Hammersmith Post-Graduate School in London, England. When he arrived in Peterborough in 1937, he had become a well trained cardiologist and was the only doctor in the area with his own ECG machine. In 1948 when the Royal College offered specialty status to those who had demonstrated competence in their field, he chose to write the exams and was one of the few of his vintage who successfully passed his fellowship exams. With the collaboration of Drs. Mitchell and Nott and the addition of Drs. Aitken, D. Clark, Epping, J. Howes, Morgan and Whyte, The Medical centre was incorporated in 1949. At that time, the group occupied four buildings, two on the northwest corner of Charlotte and Reid Streets, and two across the street on the south side. The move to the present site at 707 Charlotte Street occurred in 1954. This information was graciously provided by Dr. John W. Martyn, former Surgeon at The Medical Centre, now Member Emeritus.